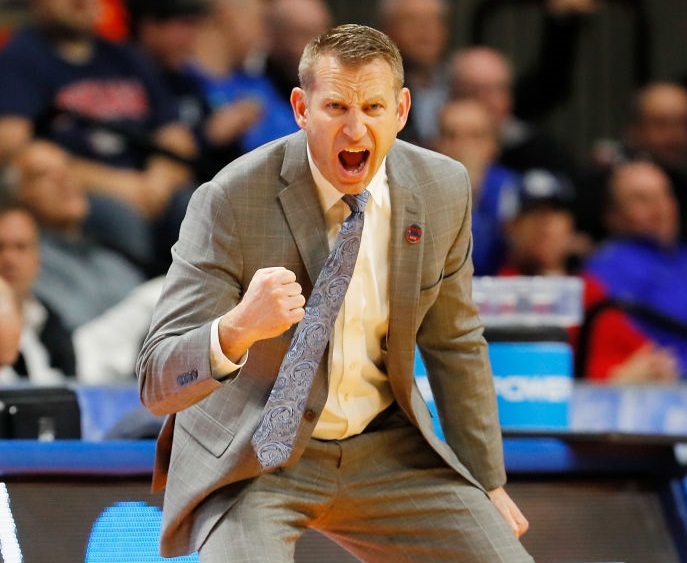 Alabama introduced Nate Oats as its men’s basketball coach Thursday, less than 24 hours after his resignation from the same position at the University at Buffalo. Alabama announced Oats' hire Wednesday, three days after he completed his fourth season as head coach at UB. Oats replaces Avery Johnson, whose departure was announced Sunday. Johnson had a 75-62 record in four seasons at the school, including 18-16 this season. In four seasons at UB, Oats led the Bulls to a 96-43 record, including 52-20 in the MAC. UB won three MAC Tournament championships, including the 2019 title, and made three NCAA Tournament appearances with Oats as its head coach. Oats discussed his coaching philosophies, his belief in a blue-collar style of play and his goal of getting the Crimson Tide to the top of the Southeastern Conference. With Crimson Tide football coach Nick Saban in attendance at Oats' introduction, Oats also gave a nod to Saban’s program, a perennial contender for the College Football Playoff championship. Oats said he received a phone call and a voice mail message from Alabama athletic director Greg Byrne regarding the opening Monday when he and the UB men’s basketball team landed in Western New York the day after a 78-58 loss to Texas Tech in the second round of the NCAA Tournament in Tulsa, Okla.
Oats did not say during the news conference if he visited Tuscaloosa prior to Byrne’s phone call. Byrne said he and Jeff Purinton, Alabama's executive associate athletics director, met with Oats and his family Tuesday at their home on Grand Island, and discussed the opening, as well as Oats' values as a coach. Byrne also reached out to Oats' former players to learn more about him. "We learned about what he believes from a culture and program standpoint," Byrne said. "Maximum effort. Continuous growth and selfless love." Oats said the makeup of his coaching staff could depend on what happens with the coaching situation at UB, and that he could keep one current Tide assistant. Buffalo assistant coach Bryan Hodgson, who has been at UB for four seasons and has been one of UB’s primary recruiters, told the News on Thursday that he wants to be considered for the vacancy at UB. Oats told reporters after the press conference that Hodgson is "definitely coming” to Alabama unless Hodgson replaces him at UB. Oats also plans to talk to the remaining Alabama assistants and Byrne said Oats is cognizant of in-state connections as he forms his staff. Hodgson joined Oats and his family in Alabama on Wednesday. Oats’ departure from UB already has impacted UB’s recruiting. Less than 15 minutes before Oats’ introduction at Alabama, Andre Allen, a 6-foot-9 forward from Arizona Western College, posted on Twitter that he has requested a release from his National Letter of Intent with UB, and plans to reopen his recruitment. UB has not said how it will handle the request for releases during its coaching search. In addition, Richard Hawkins, a 6-8 center from Findlay Prep in Las Vegas, received a scholarship offer from Alabama on Wednesday. Hawkins is expected to make his college choice on Saturday. Buffalo was in his top five before Oats left for Tuscaloosa. Alabama's hiring of Oats came less than two weeks after he signed a contract extension that would keep him as UB's head coach for the next five years. It also would have made Oats the highest-paid coach in the MAC, at $837,000 annually. Byrne told reporters in Tuscaloosa that Oats has signed a memorandum of understanding for a five-year contract. While the pay terms were not announced, Oats will likely get a significant bump in salary. Johnson was making $3.06 million a year, and a USA Today database that lists salaries of coaches from 77 Division I program, lists all 14 SEC coaches as making $2.04 million annually in 2019. "I was a high school math teacher six years ago, so it’s not all about the money for us," Oats told reporters after the press conference. "Obviously the money doesn’t hurt. But I’d like to play for national championships.